For the past few years, many of you have found your way to Smith.ai from a highly referenced thread on Lawyerist.com, titled "Alternatives to Ruby Receptionists." Unfortunately, as Ruby is a $30,000+/year sponsor of Lawyerist, that thread is gone now. However, thanks to Archive.org's "Wayback Machine," the comments have been preserved. 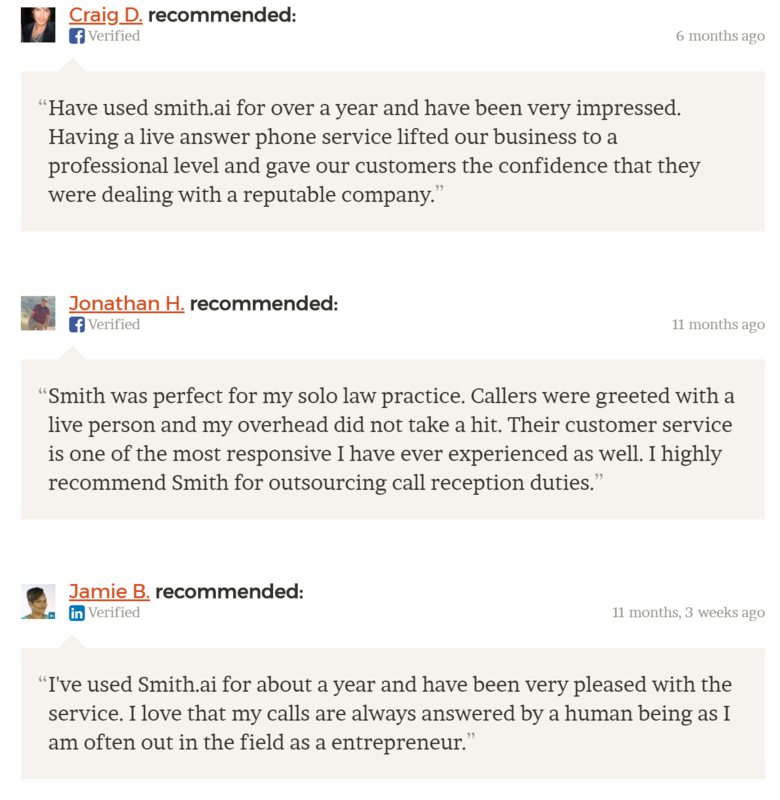 Here are positive testimonials from happy Smith.ai customers who shared their great experience. "I wanted to specifically add to this thread because after carefully reading all of the comments on here I switched from Ruby to Smith.ai. I flat out could not be happier. While I get that Ruby is still cheaper than a full time receptionist, I still needed more predictability in my bills. I also think with what technology can do for us these days, a full time receptionist is not the best way to spend money depending on what you need for your practice. With all virtual reception - there is huge benefit in being able to answer office calls wherever you are. For me, being a family law attorney, that means taking calls as I am able between hearings. At my old firm I would walk in from a morning at court will a pile of calls to return with little notes scratched out on paper. In my quest to be more paperless, Smith.ai has really been outstanding there too. All call notes come in as emails and there is even a call summary at the end of every day. They took great notes on my practice. Smith.ai knows what types of cases I handle....what counties I practice in...and who my usual referrals are to when I cannot take a case. I use calendly which is sync'ed to my Google Calendar and they schedule prospective new clients who meet specific parameters. When I left a few months back RUBY DID NOT HAVE THIS ABILITY. I would get tons of calls that were not lucrative at all to me that I had to personally return because Ruby did not really have a good handle on what my office does. If I wanted them to schedule something I had to take the time to look in my calendar myself and type out an email or "assist" request in their app and specifically tell them exactly what to say and what dates/times to offer. It was so tedious. And expensive. Those Ruby receptionists were very kind and would take to people however long they wanted at a per min charge. And it was so awkward because if they called someone and left a voicemail very often the person would just call right back, get a different receptionist, who would then take another message to call them back. Argh. I was quite hesitant to switch because Ruby, as has been mentioned in several places on the internet, is the "cadillac" of virtual reception and Smith.ai doesn't have as many reviews on the internet. So I thought I would be making some concessions to save some money and get some predictability in billing. Well, a few months into my Smith.ai experience I must say I was so very wrong to think it was taking a step down. The receptionists sound just as nice and professional. The technology is just as good and really better. They block annoying solicitors very well. They can schedule without my intervention at all. And less receptionists seem to handle my particular account so it seems like they actually know my business better. PNCs who actually meet my requirements end up in my calendar. Given how hard this could be with Ruby it almost seems magical. Smith.ai receptionists have gone out of their way to look things up on the internet to understand a situation better. I mean, really, it is above and beyond. And my bills....they are lower than Ruby and predictable. They have been the same each month. In conclusion, I somehow stumbled onto something amazing and better for a better price. I know it usually doesn't happen that way. But it did here. And I thank all of you on this thread who took the time to write something and weigh in on this issue - especially those of you that tipped me off about Smith.ai." I've been using Gabbyville for about 9 months, and while I'm generally satisfied, I decided to make a switch to Smith.ai. I had filled out and then revised my "meet and greet" with Gabbyville and they never seemed to follow it. I've used up my trial at Smith.ai and I really liked that they send me not only a message after any call, but also a daily summary. Gabbyville would send me a weekly spreadsheet (which they forgot to do for several weeks, so I missed billing for calls). The Smith.ai emails are much more visually pleasing, and I can just text them when I'm away or with a client, whereas Gabbyville I would email it when I was in court or out for a long period of time. Another good choice is Smith. They have done an excellent job. They cover my phones 9a-6p EST. They are helpful and friendly. They are in the price sweet spot. They don't have an incentive to charge by the minute. They are new and are very responsive to market feedback. I used Smith.AI, and they are very responsive and a great service. Though I didn't ask them to do my intakes or schedule appointments, I think that was an option that was available. What they did do for me is to answer my calls b/w 9 and 6pm PST and either take a message or live transfer the caller over to me based on certain criteria that I picked. Its a great service that I think is more cost-effective than Ruby and though I didn't end up sticking with them due to cost issues (my firm is still in its infancy), I would take a look at them. Smith.ai offers a free trial for 10 calls or 30 days, whichever comes first. Ruby offers a 14 day free trial. Neither service charges for setup or requires a contract. At Smith.ai, we believe a full 30 days is necessary for you to understand what it's like to work with your virtual receptionist service. In just 14 days, you might only have a few types of callers and you won't understand how your virtual receptionists approach difficult or VIP situations. We want you to know exactly how our receptionists will answer your calls based on a variety of caller types and business scenarios. *Since Ruby charges per half-minute and includes in their outbound calling charges, "the time they spend preparing for the call (reading your initial request) and sending a follow-up email to fill you in on the results of the call," outbound calls made by Ruby are more time consuming, and hence more costly, than inbound calls. Smith.ai charges per call, and does not charge for call preparation time. At Smith.ai, you're billed per call, not per half-minute, which means your costs are more predictable. Calls are calls at Smith.ai: you're billed the same for each call, incoming or outgoing. Not so with Ruby: Incoming calls are calls, but outgoing calls have preparation and recap/notes time tacked on. How much prep time is required by the receptionist? It will vary. With Smith.ai, it's binary: A successful call is a call. An unsuccessful call (spam, unsolicited sales, wrong number, blocked number, etc.) is free. 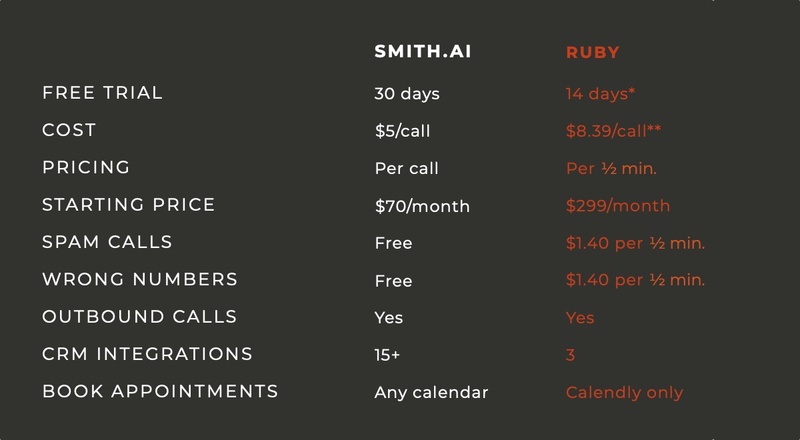 Also note that the entry price is over four times greater at Ruby than Smith.ai, with Smith.ai's lowest plan coming in at $70/month and Ruby's at $299/month, making Smith.ai more affordable at the entry level to solo professionals and small businesses. Moreover, Smith.ai's receptionists are able to take on real work like new client qualification and intake, appointment scheduling and payment collection, and not just relay messages. This is what drives major time savings and builds efficiencies into small businesses, so small business owners can focus their time on the work they love (and get paid) to do. In the end, unless your business does a lot of work on weekends and follow-up can't wait until Monday, Smith.ai offers a superior and far more comprehensive service at a comparable, if not lower, cost. See more recommendations for Smith.ai for our highly rated Virtual Receptionist Services services. The best way to compare Smith.ai to Ruby Receptionists is to try both services. We offer a 30-day/10-call free trial. To learn more before signing up, call us at (650) 727-6484 between 6 AM and 6 PM PST, or email us at support@smith.ai. We can't wait to show you how we can help your business capture more leads, make your existing clients happy, and help you reduce interruptions for more productive work days — all at an affordable price. Note: This blog post was updated April 25, 2019 to reflect price and feature changes.